In early January, the Los Angeles Lakers went through an almost unthinkable wave of injuries. Within a two-game span, the team’s entire big man rotation crumbled with a laundry list of various maladies; Dwight Howard with a torn labrum in his right shoulder, Pau Gasol with a brutal concussion after an errant JaVale McGee elbow and reserve Jordan Hill with a torn labrum in his left hip. At the time, it was frankly implausible that this could happen all at once. The Lakers had already been snake bitten all season long, with Steve Nash, Steve Blake and Gasol missing huge chunks of games with various injuries. The thought of one star going down was devastating enough–but a coach’s entire front court getting hurt? All in a 48-hour period? Ridiculous. During Game 2 in the opening round of the playoffs against the San Antonio Spurs, Mike D’Antoni’s back court rotation cratered with various physical problems. In addition to Kobe Bryant (ruptured left Achilles tendon) and Jodie Meeks (sprained left ankle) being on the shelf in the past week, Steve Blake strained his hamstring, while Steve Nash aggravated an already painful nerve irritation affecting his back, hip and hamstring. Blake has already been ruled out for tonight’s game, while Nash and Meeks are listed as doubtful. It appears that much like that fateful 48 hour period in early January, what remains of an already fragile Lakers guards corps has gone down in 3 short days. With two dramatic victories this weekend by the Boston Celtics and Oklahoma City Thunder, both the Eastern and Western Conference Finals series have essentially been reduced to 3 game series. The final four teams all held home-court serve, so it’s down to three games apiece every other day this week to decide who heads towards the championship round. For NBA fans in Miami, Boston, Oklahoma and San Antonio, the next 6 days are going to be sheer agony – none of these cities are going to be sated by a mere conference crown. They’re all title contenders whose goals start and end with an NBA championship. Win or lose, nothing’s been accomplished except for taking years off the lives of these four fan bases. The one silver lining to BockerKnocker’s Knicks and my Lakers getting bounced weeks ago is that our hearts have been rapidly calcified in the wake of our collective playoff disappointment. No longer feel the palpitations associated with a ball clanging hard off the back iron or careless pass floating to the other team. I happily and calmly watched this weekend’s action with wavering attachment depending on whoever had the lead. The Lakers fan in me wanted the games to end up in a tie, just so that everyone would be miserable. However, the basketball fan in me felt the slightest tickle in my cold, black heart watching Rondo pick apart the Miami defense and Kevin Durant continue his ascendancy to another level of stardom. However, we need to check-in with people that still have a pulse, feel feelings and of course, care about the game’s outcome past pathetic Lakers apologist biases. Two MAMBINO correspondents, have graciously agreed to help us out and take the temperature of these series with the score tied at 2-2. KOBEsh: In the first two games, San Antonio looked like an unstoppable offensive juggernaut, shooting a combined 50% from the field and averaging 110 points a game. They were on a freakin’ 20-game win streak. In so many ways, they looked completely unbelievable – getting open shots whenever they wanted, and completely effortlessly at that. The OKC defense was reduced to rubble, and the only thing that Scott Brooks could do to slow down the Spurs attack was to play the much maligned “Hack-a-Splitter’ (which, to Brooks’ credit worked). 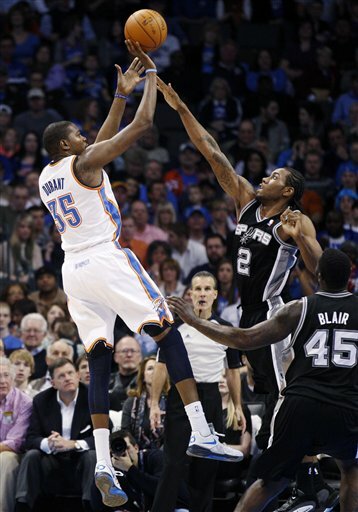 In your words, the Spurs just flat-out looked like the better team. So what’s changed the last two games? In Game 3, it seemed like San Antonio came back to Earth a bit, only scoring 82 points, shooting 39% and not looking like the Harlem Globetrotters. However, in a Game 4 loss, they still racked up 103 points, shot 47% from three and 50% from the field. How are the Thunder winning these games? What would you say is the main component that’s changed? Thunderstolt: The key word here is effort. the Thunder are winning games with effort. 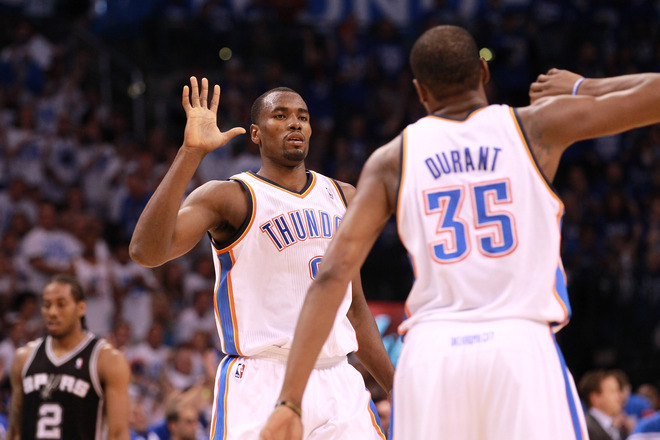 In games three and four the Thunder have put together games chalked full of effort to a man. Scott Brooks said it best: to beat this Spurs team, you cannot have only one effort on a single defensive possession but two, three, and even four times in a 24-second shot clock – you must account for those five guys because when you don’t, you give up a layup or wide open three.